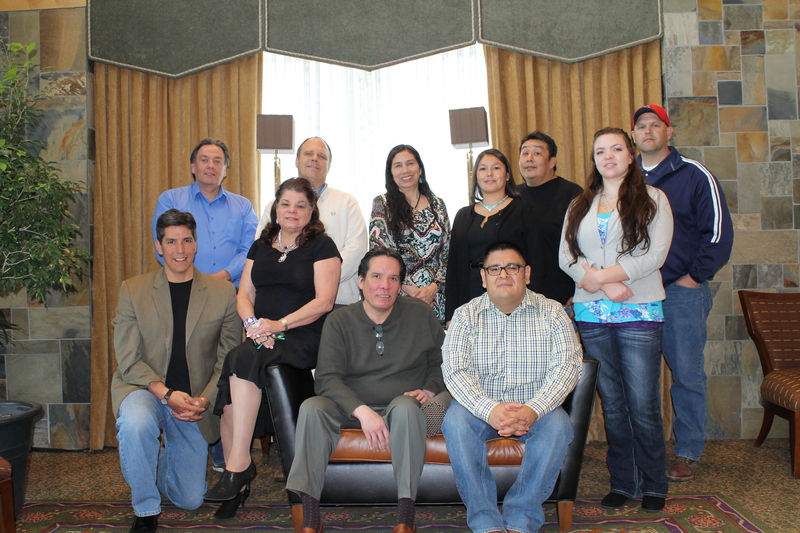 On May 2, 2014, First Nations brought representatives from the Oneida Tribe of Indians of Wisconsin, the Hopi Education Endowment Fund (Arizona), the Mille Lacs Band of Ojibwe (Minnesota) and the Spokane Tribe of Indians (Washington) together in Denver, Colorado, for a final meeting of the Native Asset-Building Partnership Project. The project was meant to strengthen tribal and Native institutions through peer learning and model development that will help improve control and management of assets for the Oneida Tribe and the Mille Lacs Band. First Nations found tribal mentors to help the Oneida and Mille Lacs design programs that will support, educate and strengthen the capacity of the youth of each tribe. The Hopi Education Endowment Fund (HEEF) is an Internal Revenue Code (IRC) Section 7871 program that raises funds for Hopi students’ education. This means HEEF is recognized by the Internal Revenue Service as being a division of a tribal government that can receive tax-deductible donations. HEEF has mentored the Oneida on designing and implementing an IRC Section 7871 program. Oneida has chosen to put together a framework for an Oneida Youth Leadership Institute to encourage, empower and provide leadership training to tribal youth. Oneida has chosen to use the IRC Section 7871 designation rather than the 501(c)(3) designation because it supports tribal sovereignty while still allowing donations to be tax-deductible. The Spokane Tribe’s Department of Natural Resources has conducted a summer youth and mentorship program for more than a decade. The department incorporates traditions and culture into its summer programs and learning camps to teach youth how their ancestors used science to fish, hunt, build housing, etc. The department mentored the Mille Lacs on designing and implementing a summer youth program in Minnesota. The Mille Lacs designed a curriculum for high school students as extra-curricular science classes that will incorporate traditions and culture. The Mille Lacs also will implement a summer internship program at its Department of Natural Resources during June 2014. This will allow a tribal youth to work with the staff and learn about the different programs within the department as well as learning about career opportunities. At the final meeting, all partners presented on their projects to First Nations and to the other partners involved in the project. First Nations also helped the two partnerships come up with action plans for the next year (after the grant is complete). The meeting was a success and the two projects developed more definite plans that will help them implement their projects in the upcoming months. The two tribes are situated far from each other – more than 1,600 miles apart – with one in northeastern Wisconsin and the other in northeastern Arizona. They experience totally different climates and landscapes, and enjoy distinctly different cultural underpinnings and practices. Nonetheless, the Oneida Tribe of Indians of Wisconsin and the Hopi Education Endowment Fund, a Section 7871 program of the Hopi Tribe of Arizona, are partnering in an effort to improve both of their communities, thanks to First Nations Development Institute’s Native Asset-Building Partnership Project. It’s a long-distance relationship that holds much promise. Many Native American communities have lost control of many assets over time. Without control, the benefits of the assets flow away from tribal communities. First Nations launched the Native Asset-Building Partnership Project between 2008 and 2010 with funding from various organizations. It was intended to explore the use of tribe-to-tribe peer learning as an effective asset-building strategy and as a vehicle for tribes to share, explore and expand other strategies for sustainable economic development in Native communities. The project was a success and paved the way for further partnerships. This year, in 2013, the Hopi Education Endowment Fund and the Oneida Tribe of Indians of Wisconsin are partnering under the Native Asset-Building Partnership Project to strengthen their ability to implement and sustain asset-building projects. They also will engage in an evaluation to document the learning process and outcomes in order to create an even better model for future use. This year’s effort is supported by the Otto Bremer Foundation and The Nathan Cummings Foundation. The Hopi Education Endowment Fund (HEEF) will share its knowledge of philanthropy and IRS Section 7871 organizations with the Oneida Tribe in order to help them establish their own successful Section 7871 organization. The Oneida Tribe will receive a grant to start its own IRS Section 7871 organization. HEEF will also receive a grant to cover staff time spent on mentoring the Oneida Tribe. HEEF will also be able to use the grant to increase its organizational capacity and become a stronger organization. By doing this, HEEF will continue to have the ability to serve its community. Just this month (March 2013), both partners finalized a Memorandum of Understanding that lists their individual responsibilities, a timeline, project benchmarks and expected outcomes. A site visit to the Oneida Nation is planned for early April by representatives of HEEF, a consultant and a First Nations staff member. This site visit will allow for an in-person meeting, relationship building, a tour of Oneida’s community for HEEF representatives, and to get the ball rolling on the project.